The first ever effort to use a vaccine to stop an Ebola outbreak in its initial stages is taking shape in the Democratic Republic of the Congo (DRC). The international response to health emergencies in sub-Saharan Africa is often maddeningly slow. But this time around, international agencies and the DRC government sprang into action, hoping to quickly extinguish the outbreak. “Everything is organized,” says virologist Yap Boum, who works with Doctors Without Borders (MSF) and is helping launch the vaccine effort. 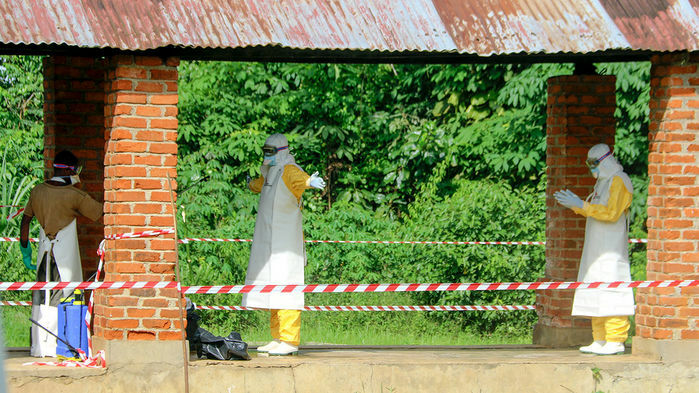 Boum, who lives in Yaoundé, Cameroon, began planning his trip to the DRC as soon as it confirmed on 8 May that two Ebola cases had occurred in the remote Bikoro health district in the Équateur province. By tracing contacts between the infected people and others who had Ebola symptoms, such as high fevers and diarrhea, the DRC’s Ministry of Public Health (MOPH) determined that the virus has likely been spreading since early April. As Science went to press, a total of 25 other probable cases and 14 suspected ones had been identified in Bikoro and two adjacent health districts. Nineteen of these people have died. Boum says the most alarming news from the DRC so far is that two of the probable cases are in Mbandaka, a port city of 1.2 million people. “The possibility of the virus spreading is huge,” adds Boum, noting that while Ebola is incubating undetected—which can take several weeks—the victim is already infectious. DRC President Joseph Kabila has authorized MOPH to use every tool at its disposal, including the experimental vaccine against Ebola, which worked spectacularly well in a clinical trial that Boum helped run in Guinea in 2015 at the tail end of the recent West African epidemic. The World Health Organization (WHO) also acted quickly, immediately sending a team to the DRC to coordinate the response, which includes improved surveillance, introduction of safe medical and burial techniques, and the establishment of quarantine units operated by MSF and others. WHO Director-General Tedros Adhanom Ghebreyesus even visited Bikoro last week. WHO has been heavily criticized for its slow response to the West African epidemic, the worst Ebola outbreak on record, which sickened more than 28,000 people and killed an estimated 11,310 before traditional containment efforts ended it. The DRC considered using the vaccine for an Ebola outbreak last year, but it met with hurdles including importing the vaccine and uncertainty about whether the virus had moved beyond remote villages. “This time they’re much better prepared,” says Seth Berkley, who heads Gavi, the Vaccine Alliance, a nonprofit based in Geneva, Switzerland, that purchased a stockpile of the experimental vaccine and is providing financial assistance to the DRC. The vaccine consists of a harmless livestock virus genetically engineered to display Ebola surface proteins. It is made by Merck and not yet licensed for use by any country, but can be given as part of a trial under what are known as compassionate use regulations. The trial protocol, approved by DRC last year, relies on a “ring” strategy in which only people who have come in contact with cases, their contacts, health care workers, and other front-line responders are vaccinated. At press time, surveillance teams had identified 393 contacts. Some 8000 doses are being shipped to the DRC from WHO’s Geneva headquarters and Merck’s U.S. storage site. Special Arktek containers have already arrived that can maintain the vaccine at below freezing temperatures for travel to remote locations. MSF will sponsor the trial in collaboration with investigators from the DRC’s health ministry. The team will follow vaccinated people for 84 days to assess whether any develop Ebola and to evaluate side effects.